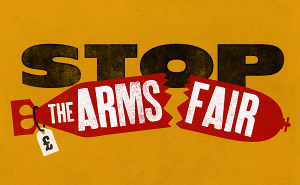 Join East London Against Arms Fairs (ELAAF) for a musical protest against the arms fair. This will be outside ExCeL London which has been the site of previous “DSEI” Arms Fairs and where another is threatened in 2017. More musicians and singers (all styles) are welcome to join us. You can also join in if you are not musical. We need people to collect a petition, hold up posters, give out leaflets etc. From Prince Regent DLR Station just follow the signs to ExCeL. We will be at the end of the walkway near the East entrance to the ExCeL centre. For more information, contact elaaf(at)hotmail*co*uk.